The mission of the Gary and Mary West Senior Dental Center is to provide affordable, high-quality oral healthcare with comprehensive education, clinical, and wellness services for seniors in need, enabling them to live healthy, independent, and productive lives. With 10,000 Americans turning 65 every day—70% of them lacking dental insurance—poor oral health in seniors has reached crisis proportions, with low-income seniors faring even worse. As a practicing dentist with a public health background, Dr. Becerra knows that action needs to be taken to improve seniors’ oral health and quality of life. While volunteering alongside philanthropist Mary West at Serving Seniors’ Gary and Mary West Senior Wellness Center (GMWSWC), Dr. Becerra and Ms. West were saddened to observe many seniors who couldn’t eat the nutritious meals they were helping to serve. Seniors explained that they were unable to access care due to high costs, a shortage of Denti-Cal participating dentists, and lack of transportation. To address this need, the Senior Dental Center was launched in June 2016 with the support and collaboration of the Gary and Mary West Foundation, Serving Seniors, private and public agencies, and vulnerable seniors themselves. 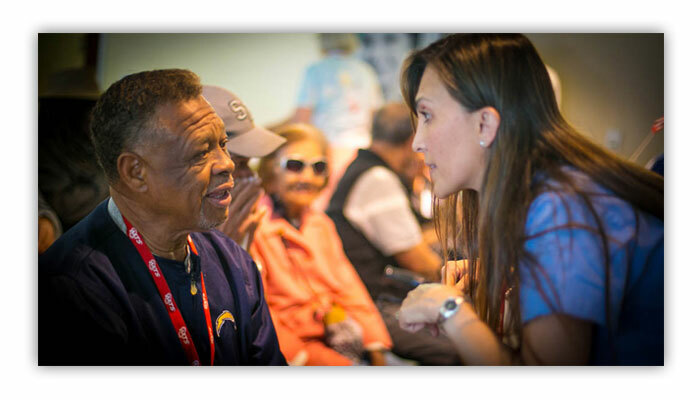 Since then, the Senior Dental Center team has worked tirelessly to treat seniors in desperate need of oral healthcare, becoming strong advocates for “re-connecting the mouth to the rest of the body” and encouraging others to join their cause. At the Senior Dental Center, our goal is to treat the whole person and ensure that the right care is delivered at the right time. Our patients are screened, triaged and their care is coordinated—all on-site. We strive to enable seniors to properly maintain their oral health through education and dental services that impact the progression of disease. Working with Serving Seniors at the GMWSWC, the West Health Institute and West Health Policy Center, we gather rigorous data and conduct research to demonstrate the clinical and economic impacts that our innovative model can have on health outcomes and quality of life. Our research will help inform policy work designed to drive needs for reform, new legislation and help us achieve our long-term goal of making our innovative, integrated model of care a prototype for replication in other places throughout the state and nation.